My sound project, Free Static, is performing a live score to a film by my friend and ECA colleauge Julia Oldham, in January and February. See the info below. We’ve been working on this project for a few months now. Though we’ve performed it several times in rehearsal, it never comes out exactly the same. We only have a rough starting point for each section of the film. This makes it really exciting to perform, as we are still able to react to each other, as well as the film. Throughout the piece, I am manipulating a set of samples (some I’ve created, and some I’ve found), and Chris is working through a set of drones and rhythmic patterns on his modular synth. We both employ delay, reverb and ring modulation effects, so the sounds get pretty spacey and wild. This performance of “View of the Red Forest” also features the Eugene premier of Julia Oldham’s short film “Fallout Dogs” - a documentary about the stray dogs living in and around Chernobyl. Read about this event on ECA’s website. Julia Oldham's multimedia installation "View of the Red Forest" is a portrait of both the dilapidation and rebirth of the Chernobyl Exclusion Zone, combining large prints of windows looking out of abandoned buildings onto lush landscapes with video documentation of Oldham's visit to the zone. For this project Oldham is teaming up with Free Static (Courtney Stubbert and Chris Ruiz), a Eugene-based improvisational sound duo blending modular synth and musique concréte. Free Static will perform a live score to the film in the installation space on Saturday, January 12 at 8:00 PM. In April of 1986, an explosion in Reactor 4 of the Chernobyl Power Plant in the Soviet Union precipitated the worst nuclear disaster in history. The explosion created an enormous dust cloud carrying deadly radioactive isotopes which spread across Europe, affecting much of eastern Europe and Scandinavia. 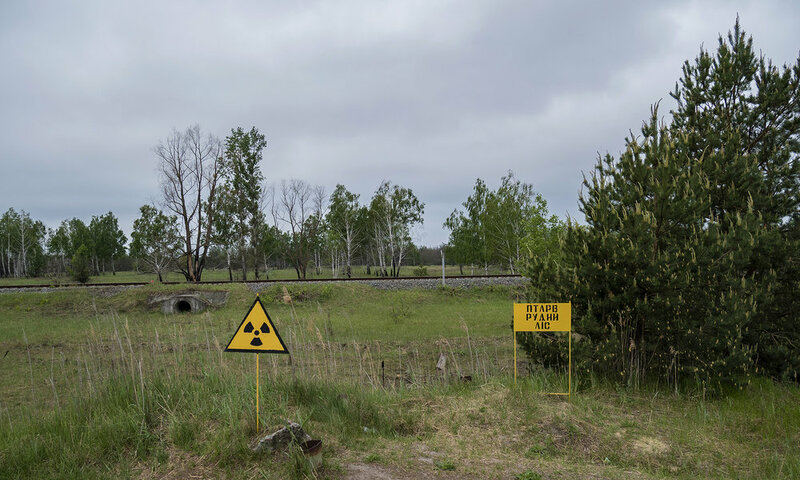 The the most severe contamination, however, settled in what is now known as the Exclusion Zone, a 1000 square mile area in Ukraine surrounding the power plant. The Red Forest is a 4 square mile wooded area that received some of the highest levels of radioactive contamination resulting from the explosion. After absorbing huge doses of radiation, all of the trees died and turned a rusty red color, which is where the name of the area derives. In the clean-up effort, the forest was bulldozed and buried underground, and a new forest was planted to stabilize radioactive isotopes. The Red Forest is now green and beautiful, and both flora and fauna are flourishing in the absence of humans. It remains one of the most radioactive areas in the world. With no space to set up my drums for the last year or so, I’ve been getting into electronic music gear lately, and learning the ins and outs of running sound through delay, distortion and my Moog Ring Modulator pedals. I’ve also been making tape loops out of old cassettes and utilizing a 4 track recorder to sample and perform with. It’s been fun and frustrating at the same time. Old gear breaks easy. Your favorite tape loop will fall apart. Your guitar pedal batteries will die on you in the middle of a session. But I’ve made a point to stay away from laptop based music, in favor of making sounds with actual hardware you can perform with. What started out as a group of guys getting together, playing records, and talking about music, turned into a few of us improvising instrumental jam sessions at my former studio space (RIP my old friend). That party shrunk to just two of us and we decamped to my friend Chris Ruiz’s hacienda studio. Unable to play my drums in a quite neighborhood, we started making layered found-sound pieces utilizing everything from hand percussion, non-musical objects, tape loops, modular synths, and the occasion homemade spring resonator. After about a year of recording sessions, we curated a handful of tracks and release our first project this past July. The project is called Free Static, and you can hear our self-titled, 6 track release on our Bandcamp page. It’s a free download. FREE. We are putting together a limited edition cassette release (you read that correct) and I’ll announce that as soon as it’s out. I know half of you still have a cassette deck somewhere. IT’S LIKE, THE NEW VINYL, BRO. Coming up in January and February we are performing a live score to a short film about Chernobyl made by my artist and colleague at Eugene Contemporary Art, Julia Oldham. We will be announcing time and locations for Corvallis and Eugene performances very soon. Late night session in the work space. A mini halfpipe, 2 1/2 to 3 1/2 feet tall, with maybe a painted parking block or two in a corner for mid day sessions. In truth, I feel like I'm halfway there. My 450 square foot design studio exists primarily as my base of operations for client work. I've had weekly rehearsals for a new music project, in the space for about a month, and my drums are scattered all over. I currently can't play during the day due to other nearby professional offices, but I do take screen breaks over my practice pad throughout the day, working on getting my chops back. I've recently moved my painting studio out of the dark corner of my garage, into the design office, and have spent more "design hours" doing things by hand, at least in the early stages of the creative process for client work. This has been awesome. Computers are killing me softly and I need to get out of my chair more. Double the square footage, and the monthly revenue to expand into a neighboring unit. Right now I can't leave everything out all at once. Everything needs it's own corner. Enough white wall space to continue holding monthly pop-up shows and showcase new design artifacts I'd like to make and sell this coming year. A shower so I could work out and go running during the day and smell good for the wife and daughter when I get home. The sons don't care. The building I'm currently renting space in is completely empty, except for me. Unfortunately the whole building is for sale, who knows how long it will stay on the market and/or sit empty. I have a gut feeling it will get torn down when it sells. It's the only building available on this block to demolish and rebuild in it's place, and the city is all about new development. More dreaming later. Back to work for now. Given the verdict in Furgeson, and possibly even more bewildering, the reaction, this seems timely. I have friends who hate cops. I have friends who are cops. I wasn't there so I don't know what happened. Brown's death seems unjustifiable based on the facts we have. But it's also been sensationalized and distorted to the point that our feelings are based mostly on a constructed narrative. Note: This was originally posted on Medium. This is it's new home. A small mural I painted in 2011 for a solo show titled "Modified Structures". It was a painting with no plan. The first time I understood creative process was through studying jazz. In about the 6th grade I started getting exposed to jazz through being involved in the school band program, and throughout high school, I spent most of my day time hours in a band room behind a drum kit. I couldn’t read music very well. Notes on a page never made sense to me. So I primarily learned by listening to records, and feeling my way through a given piece. My favorite records were Bebob and Hardbop from the 50's and 60's. The structures of these types of songs, at least in how we were taught to think of them, was essentially a main melody, or “the head”, leading up to a solo. A collective statement, leading to an individual response, followed by commentary by other soloist. The solos were the whole point. They were a dialogue with the experience in real time. Once you got to the jazz solo, anything could happen. There were guiding principals that lead the ear — chords, rhythms and scales — and from those came an endless chain of thoughts, statements, experiments and expressions. A great entry point for understanding “the head” vs a solo can be seen in this performance of Miles Davis’ “So What” from 1959. If a horn player or piano player had those chords and scales as the core of their language, I similarly had the entire sound of a drum kit at my disposal. You learn fairly quickly that hitting the batter head of a drum is only the beginning. The rims, shells, metal tubes of the stands, and every possible edge of a kit could be incorporated into a given statement. Speed it up, slow it down, make it up as you go. Mistakes only lasted as long as it took to exit a passage and often times those offered surprise and excitement. The “blue note” — technically an expressively flatted note in a scale — was jokingly used as a catch-all description for a dropped stick, an odd note, or a rhythm that just stretched time. It would be clear fumble of some kind, and you learned quickly how to recover a passage out of sheer panic. This moment of fear was what taught you most about improvisation, process, and how to incorporate a near-disaster into an overall statement. If the accident occurs, absorb it into the overall statement, but whatever you do, don’t stop. This is what made jazz human. No two players sounded alike, even if they were equally boring. And any given musician had the potential of blowing it. But mistakes really only had to do with how well you dealt with the situation, and the more experienced you became, the better you got at dealing with them. It by no means meant you didn’t make them. It just meant you weren’t afraid of the risk. Visual art for me is very much the same — be it a design project for a client, or a painting. When I started pursuing abstraction seriously, it was merely an extension of what I had learned playing the drums. If there was an ending to a song, it was everything that happened in the middle that made it what it was. The ending was more or less determined by a player finishing a thought or just stopping at the end of their 36 bars. A painting is merely a beginning and end, but it’s the middle that makes it what it ultimately is. I didn't plan this wall piece. I just started. The first marks on a canvas, or the first cut piece of paper for a collage, are typically just a beginning. Not a planned strategy. Just this material, on that flat surface to see what happens. The Dadaist and Surrealists perfected this kind of approach. They called it Automatism, and had much more interesting (or boring) explanations for the how’s and why’s behind it. The important thing was that it happened without a preconceived idea in mind of how something should end. The outcome was not predetermined. The only thing that is decided in any good work, even if it’s a monumental installation that takes planning and logistics, is that it begins. All that is needed from the maker is patience, and willingness to make a mistake. Sometimes the mistake forces you to white-out a complete section. That move alone could be what takes you in a direction you never would have thought of by following a plan. Just stumbled across this video. As a kid I had space shuttle blueprint wallpaper in my room and I'm still facinated by launch footage. The glitch video distortion points out that my experience with NASA and the various space shuttle launches I've witnessed were 100% mediated experience and those images only really exist in my mind as pixels. As a.d.l.r., Morera takes his progressive compocollage, minimal techno, ambience, tape music and microsound to create a highly listenable lush and coherent whole of audio ephemera that fits right in line with the immersive sounds of the Non Projects catalog. If you dig the artist you can get downloads from Bleep. Also check out the sweet, raw html website of Kim Asendorf. It's bonkers. The new Tom Waits record Bad As Me comes out Oct. 24th and you can stream it ahead of time (must request an invite) at BadAsMe.com. I've been listening to it the last couple of days and it's a good one. I've gone through pretty huge Tom Waits phases. I've got my favorites and ignored a few. This one really grabs me. It's enough of what you expect, but has some great swagger and gritty production. Read about it from his site. Speaking of Tom... this post from last year seems to get a lot of hits so you may be interested in his List of Scary Things. Classic Waits humor. Seriously. RUN D.M.C. + Animated Gif = The best gif ever. Check the work of Baster. It's been out for a bit already, and mostly it's an excuse to put some record covers on my blog. Radiohead put out 7 12" releases for their King Of Limbs record as remixes. Haven't picked the vinyl up yet, but it's on my list. In the meantime I'll settle for the digital. Great stuff including work by Caribou, SBTRKT and Four Tet. I can't seem to find any info on the artwork itself. It looks like it could be Stanley Donwood's work but there is no mention of it on his site. Anyone know anything? Read about the remixes here. Download them on Amazon. See a couple more 12" covers after the jump. Awesome. People-murdering robots. "Kill Your Co-Workers" by Flying Lotus. Animation by Beeple. 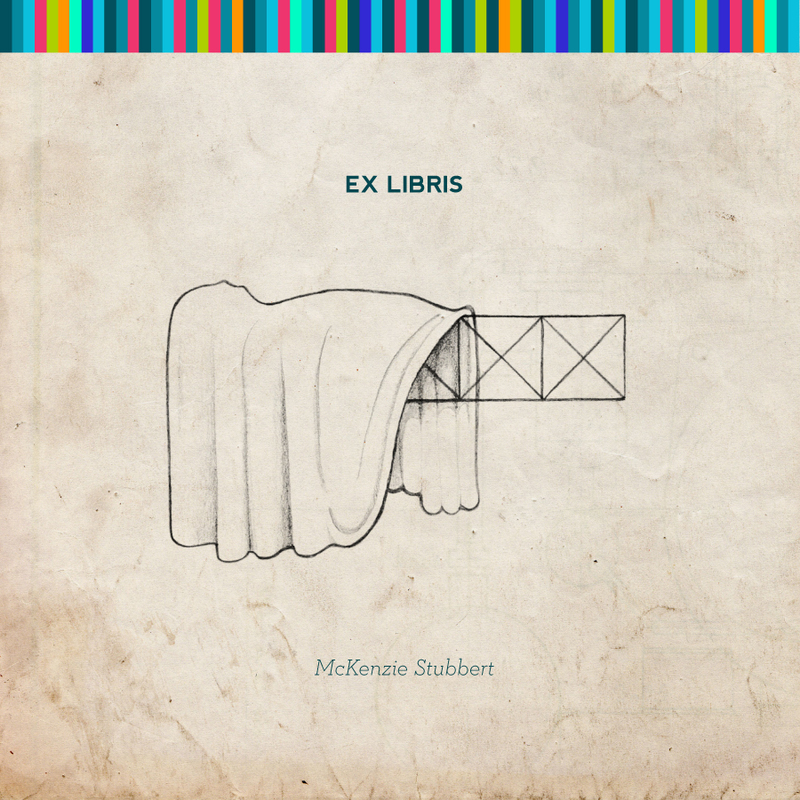 Portland composer/producer Mckenzie Stubbert (aka @pinballjukebox, aka my brother) released an EP of his newest work. I was able to do the album cover and used a drawing from my September exhibition. Buy it from his site or download it on Amazon. LCD Soundsystem - "Drunk Girls"
The new LCD Soundsystem album This Is Happening comes out May 18th (by from DFA it here, or get the download from Amazon here) and I'm beside myself with stokedness. The above video is from the track "Drunk Girls". The chaos was directed by Spike Jonze. If you aren't familiar with LCD Soundsystem then do check their last record Sound of Silver because it is awesome. A favorite jogging/designing-with-coffee-in-my-veins record of mine for sure. Below is their last album Sound of Silver . Get it and enjoy. A few days ago I posted a cover by Ghost Box label co-owner Julian House. It got me thinking about the Stereolab covers I dig so much so I went looking for the work House did for the band. This just recently went up on one of my favorite album cover blogs Hardformat. Designed by Julian House, co-owner of Ghost Box and most well known for his cover work for Stereolab. This stuff reminds me of the difference between what I like to look at as a designer versus how my own work ends up. This kind of geometry and restraint is always in my mind yet (and probably for the best) my own process ends up pushing around what I look at like a bully. Hear clips of The Advisory Circle here. This album just came out March 5th and you can purchase it from the label here or download it from Amazon. See another post on Stereolab album covers here. Every healthy relationship has it's disagreements. This is addressed in some great promos for the recent release of the The Dead Weather's video "Treat Me Like Your Mother". See a few more at their website. The Dead Weather - "Treat Me Like Your Mother"
I've been listening to this album all week. This song is dope and the video is great. Directed by Jonathan Glazer. Dig the bland suburban development in the background. Rock it. Loud. And wear a bullet proof vest. Just like your mother.